It is finally cold enough to pull out your tweed! Tweed is a warm, wool cloth originally produced in Scotland. Tweed is very popular in the UK, but you also see the fabric in many other countries! Blazers and coats are among the popular styling of tweed. We are going to show you all the fun ways to wear tweed and other fashionable items you can find it in! Shop Magee and Ann Taylor for these blazers. You can also dress them casually with jeans! Shop Nordstrom for these blazers. A tweed dress is perfect for a business woman like yourself! They are perfect for work and you can layer up with a matching blazer. Shop these dresses at Ann Taylor and Nordstrom. Capes or cover ups are so nice to have to add that added touch to an outfit. It’s like a blanket you can wear in public! We love these from Magee. Add on some layers for those really chilly days with these beautiful gloves from Magee and Nordstrom. You can’t go anywhere this Winter without your tweed bag! Shop Nordstrom and Magee for these! To keep you nice and warm this Winter, don’t forget a stylish coat! Shop these looks at J.Jill and Nordstrom. 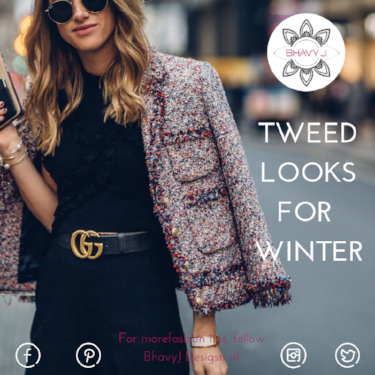 Show us your tweed looks this Winter!